Be Judicious With Links – Choose your self-serving and non self-serving links wisely. Try to narrow down your most important self-serving links and only include the one or two that are most relevant to the article. Non self-serving links are okay to use if you want to reference a source, but they ultimately lead people away from your articles and your website. Introduce Truly Original Ideas – Coin a new term or phrase. This gives you a chance to be the first to discuss some new topic in your niche. Don’t lose focus of your journey toward becoming the official expert in your field. Treat Every Article Like It’s Reaching a New Audience – Target those visitors who haven’t read any of your content before. By doing that, you’ll increase your chances of making contact with that audience. You need to be comfortable testing different writing styles to determine which works the best for you and your growing audience. Explore the Long Tail – The keyword distribution curve provides insights into exactly how you reach completely new people inside your niche. There could be hundreds, maybe thousands of web surfers out there looking for information similar to what you’re offering. They’re not hiding, you just haven’t found them yet. Explore the keyword distribution curve, and more specifically the long tail of the curve, to see where your current keywords are focused and stay open to using new keywords to reach a new audience. Understand the Timeliness of Articles – Over the long haul, timeless/evergreen articles bring in steady traffic. These types of articles should be your main focus. Use them to build the foundation of your article inventory. Timely articles may bring in more views initially, but the number of new views each month will taper off eventually. Refine Your Audience – Who is your audience? If you start writing an article without being able to answer that question, you could be heading in the wrong direction with your content. Drilling down on your primary audience will help you determine the style you write in, the length of the article and how many details to include. Stay in Tune With Trends – Take time to research current keyword trends. If you’re just starting out, try keyword research tools like Wordtracker, Keyword Discovery, Yahoo! Clues and Good Keywords. Once you have a substantial article inventory, you can use the stats from your own EzineArticles account to determine the most popular keywords. Use what you learn to make future writing decisions. Now, take these tips and incorporate them into your article writing and marketing. In no time you’ll be turning those dreams of sending highly-targeted traffic to your website into reality. 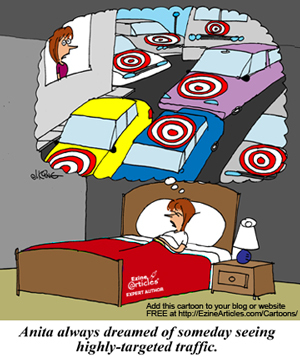 What other article marketing-related dreams (or nightmares) have you been having? Leave a comment to share and maybe we can help! As I have mentioned before, I enjoy very much the support received from the EzineArticles team. However, after my first article, I am looking for another article database as EzineArticles does not accept links to websites that are not in English. I have now contacted anoter site and got the following answer: “For this, we use Google translate. It requires a bit of scripting, but it is pretty convenient.” I am afraid that in spite of all its advantages EzineArticles will loose people like me. Great pity! Eliane K, you can’t please everybody, so don’t try. I will stick to English. I wish you luck and lots of non-English services. I guess that I did not express myself clearly enough (not so good for an author!). My concern is not with the language, but with the possibility to get traffic to my site. Anyway, this is a closed chapter for me. Thanks for taking the time to comment on my remarks. It is very simple…All you have to do is learn another language. Isn’t it a great deal? Thanks for the great tips. I enjoy working those long tail keywords, which was suggested to my by Chris many months ago. I find that these long tail keywords make for great titles! And gives me ideas of what to write about. Great tips! I know some, learned some. Using long tailed keywords in your titles is like using a net instead of 2-3 fishing poles. I have had great success with driving traffic by spending a considerable amount of time researching for not only the right keywords, but the right combinations. Great tips as usual. I always try to use long tail keywords for my titles ever since I learned about them. Great stuff. Thanks for the tips. This blog is a goldmine of article ideas and inspiration! Excellent reminders about well tested principles to use as guidelines for effective article writing. Thank you for the great tips! Always learning is a real joy especially from you Marc. Thanks for this article, I intend to start practicing it today just like your other work. You don’t know how much you help. Muchas gracias por la sugerencia de parte suya voy a tomar en cuenta las palabras sobre cmo seguir para poder tener un trfico. Translated: Thank you very much for the suggestion from you I will take into account the words on how to continue to have traffic. Thanks for more great information. I use a lot of long tails and they seem to work great. I have been using the suggested article titles and it doesn’t seem that they are using the long tail keywords but my traffic from them are great. I also always try to get backlinks from places relevant in context. Writing an article is best since then I create the context. I’m dreaming of the day when I have thousands of articles spread across the web that bring me lots and lots of targeted traffic! I often don’t think about how long an article will keep up with the times, I’ll have to start focusing on writing more timeless articles! I am a beginner and I like the advance exchange of information that I am hearing from the comments. Thanks again Steve for the revelent info. Try creating back-links too as this helps. Awesome tips and tricks for progressing in writing article. You are right and i am with you, if we get progress or change in following tips we can get targeted traffic and we can increase our business. Thanks for all these great tips. I use the long tail keywords a lot in my titles and have great success this way. I have been using the title suggestions and I don’t quite understand how they work as far as keywords in them but they are doing great for me and they give me ideas of what to write about. Thanks for supplying them for us. I understand this article better of all the articles I read today. Though I am a bit concerned. I have never tried writing an article online that relates to my business. It is not enough that you have constant traffic to you website, it needs to be targeted in order to increase the conversion rate. Thank you for sharing your tips. Just found this article (and the VERY cool cartoon!). Now this is one I definitely want on my coffee mug! As far as targeting my articles goes, I try to do that, but you just added a few excellent points to my list of things to watch out for! Thanks so much for your post. I am always looking for ways to get more traffic. This has given me some good idea’s.